Workplace wellness not only increases productivity and job satisfaction, it has major effects on employee’s health and wellbeing. Employees reduce their stress, learn ways of making incremental changes for overall health and reduce their personal health care costs. 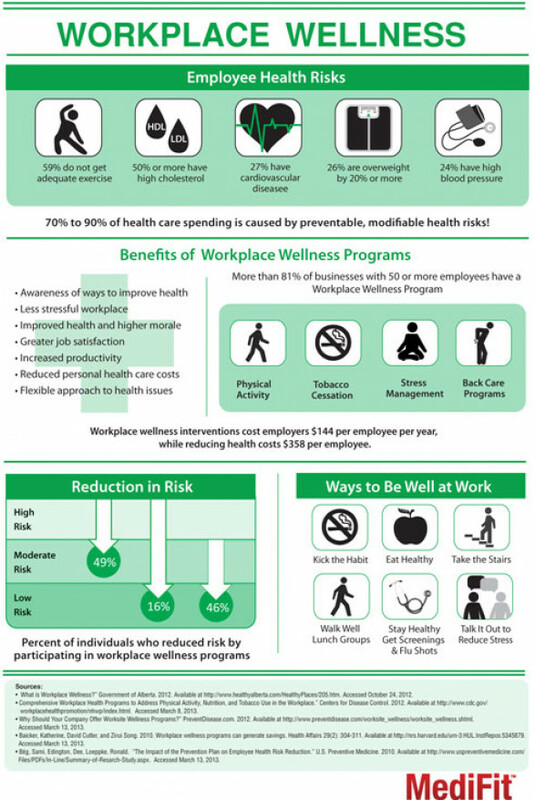 The below infographic illustrates the types of health risks employees are susceptible to and the many benefits of implementing a workplace wellness program. Kickstart your wellness initiative with chair massage! Employer-paid and employee-paid options available. Call (215)326-9352 to schedule a 'massage day' for your office. Chair Massage: The Ultimate Employee Perk! If your workplace offers it, consider your company progressive in terms of employee health. If you've never experienced it, well...in the US alone, more than $300 billion is spent yearly due to absenteeism, turnover, reduced productivity and more. It's easy to see why incorporating a regular regimen of on-site chair massage into your employee wellness program makes sense. Is YOUR office chair massage ready!?! If you’re looking for the best chair massage Philadelphia has to offer, look no further than Relax 'N Go Massage. It's easy to set up, easy to fit in a regular work day schedule, and employees appreciate a stress-busting break in their day. PLUS, it may be considered a tax write off for your business! Companies that utilize chair massage have seen remarkable benefits. Some of them have seen such a difference in morale and productivity that they schedule regular monthly chair massage sessions. The following excerpt was taken from David Palmer's "21st Century Workplace Seated Massage." The future of workplace massage is tied to the economics of health care policy. At long last, corporate, governmental and academic policy makers have come to the conclusion that a health care system whose primary focus is sickness care is doomed to bankruptcy. They have concluded the ultimate foundation of an economically viable health care system has to be prevention and wellness. The law created the National Prevention, Health Promotion, and Public Health Council(National Prevention Council), composed of the heads of 17 Federal agencies and chaired by the Surgeon General. This high-level federal action group works closely with a 25-member Advisory Group on Prevention, Health Promotion, and Integrative and Public Health, also mandated in the legislation. Both of these groups are developing plans and recommendations that will impact every strata of society, including workplace wellness. "Most people will agree that high-quality chair massage is an instant stress reducer."